If you have Jungle Scout, you are set up for success! Here are a few ways that you can leverage the robust data analysis capabilities of Jungle Scout with a list of proven winners. There are various factors at play that can make a product succeed: sales velocity/history, strength of listing, savvy advertising and marketing, competitive pricing, and much more. But how do you figure this out for yourself what the catalyst for success is? Specifically, study historical trends, macro trends, and track the daily sales going forward. In short. These are all things that you will find in the product tracker. There are many sub-categories and keywords that you can pull out of this list. This is a great starting point to drill into the niche further, and analyze the niche as a whole. Simply pull up the Niche Hunter (in Web App Standard And Business plans), and drop in any keywords that you find interesting. Did you know that you can filter the Product Database by entering specific keywords? Just as you did with the Niche Hunter above, you can enter in a keyword to generate even more ideas, with one click. Sometimes success on Amazon can be iterative, meaning that you improve on someone else’s proven success. Simply find successful and savvy sellers, and study what they do. What products, niches, categories do they sell in? Where are they finding success, and why? The Jungle Scout Chrome Extension is a great way to reverse-engineer the success of others. You can take a product from the list of 10k top products, and look it up on Amazon. On the product page, you will see who is selling the product. And then simply pull up your Jungle Scout Extension data to see what products the seller is succeeding with…. If you do not own a Jungle Scout product, don’t worry, we can still help you! Choose some product ideas or categories that you find interesting. Then head over to the Jungle Scout Sales Estimator to get the estimated monthly sales (in units). 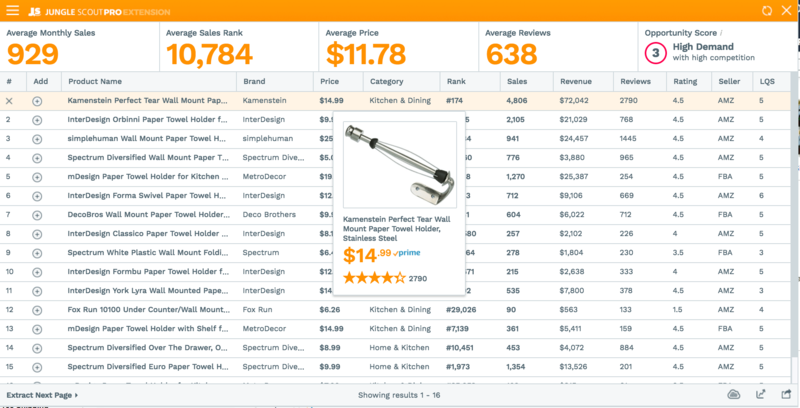 It’s easy: just enter the Best Seller Rank of the product into the Estimator for the appropriate category, and you instantly get the estimated sales units. You can multiply the Retail Price times the units sold per month. You will have to account for the cost of goods sold, shipping, and Amazon fees. We have listed everything you need to know, and a handy worksheet on this page. So ready to get started on a HUGE list of proven winners? We will continue to share some insider tips on how to sort through the list and verify that you are starting your Amazon business on the right foot!